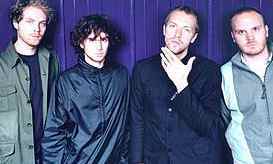 Formed while at University College London, Coldplay have emerged in recent years as the band at the forefront of the UK's new rock scene. Debut album Parachutes was a massive success, spawning hit singles Don't Panic, Shiver, Trouble and the anthem Yellow. 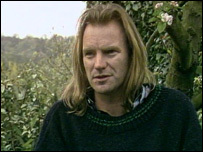 2002 follow-up A Rush of Blood to the Head was even more successful and contained the hit singles In My Place, God Put a Smile upon Your Face, The Scientist and Clocks. With America starting to take notice, the future looks very bright for Coldplay. 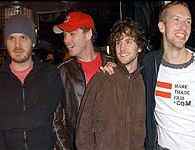 Coldplay to perform at Glastonbury 2005 ? From the Chris Martin profile ! "Martin's songs, characterised by minimalist, impressionistic rock tunes, resonating with shades of Kraftwerk and U2, and lyrics tinged with wistful thoughts of romance and darkened by existentialist angst, often veer inexorably towards the melancholic."